Israeli soldiers abducted, on Sunday evening, a young Palestinian man at Huwwara roadblock, south of the northern West Bank city of Nablus, and injured dozens of Palestinians in an invasion into Jayyous town, east of the northern West Bank city of Qalqilia. The Nablus office of the Palestinian Prisoners Society (PPS) said the soldiers abducted Nassr Jamal Mabrouka, 24, after stopping him at Huwwara military roadblock, south of the city. 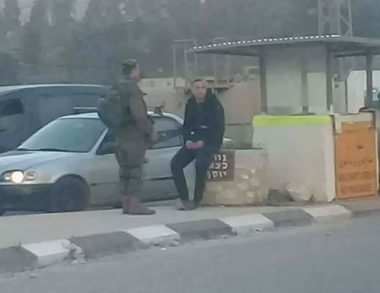 It added that the soldiers cuffed and blindfolded the Palestinian and took him to Huwwara military base. In addition, dozens of Palestinians suffered the effects of teargas inhalation, after many Israeli army jeeps invaded the town, and fired a barrage of gas bombs at Palestinians, who protested the invasion. The soldiers also targeted several homes with gas bombs, and flares, in the eastern neighborhood of the town.